The GeForce GTX 1060 is Nvidia’s most powerful mid-range Pascal GPU. It masters 1080p gaming and can hold its own when it comes to both 1440p and VR. And even though it may seem like its glory days are over with the coming of the RTX 2060, there is still a reason why you might go with this last-gen card. Indeed, the GTX 1060 is quite affordable now that it’s overtaken by the new series of GPUs with a new moniker, but it is still a great choice for those who want to get into 1440p gaming or VR, as well as those looking to get high framerates in 1080p. 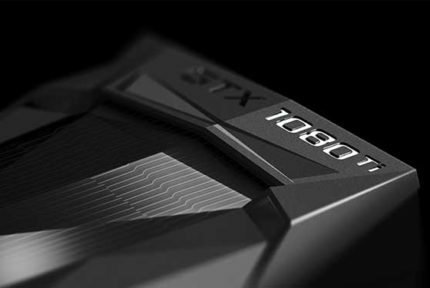 Of course, there are a number of versions of the GTX 1060 made by different manufacturers, each with their own pros and cons, differing in terms of cooling, aesthetic, performance, and pricing. So, which one should you pick? Read on and find out! We will be starting this list with a card from EVGA, one of the oldest and most-renowned Nvidia partners. And while they may manufacture a wider array of components today, including motherboards, power supplies, and more, Nvidia graphics cards remain their forte. Now, the particular model that we have here is not exactly a flagship. It is a compact card, equipped with only a single ACX 2.0 fan and featuring a nice but somewhat cheap-feeling exterior, especially compared to this manufacturer’s pricier models. Ultimately, this EVGA GTX 1060 model shines in two areas: it is fairly affordable and its compact frame means that it will be able to fit even in the smaller computer cases. As such, it is the go-to solution if you’re looking for the cheapest GTX 1060 available, especially if you have a Mini ITX case. On the downside, the single-fan cooling doesn’t leave much room for maneuvering when it comes to overclocking, so this card doesn’t perform as well as the other models which sport multiple fans. Asus is perhaps best known for their flashy RoG Strix graphics cards (and other RoG-branded components/peripherals), but the ASUS Dual Series GeForce GTX 1060 differs quite a bit from the usual RGB-heavy RoG design. It has an unusual all-white exterior and two simple-looking but quite powerful fans. And even though it is an “entry-level” variant of a mid-range graphics card, this GTX 1060 performs quite well and even comes with some good out-of-the-box factory overclocking. Even though Asus markets this as a mainstream card, it is still a premium-quality product with remarkable performance. By itself, the card’s conspicuous white exterior is not exactly neutral, but the only reason why not to go with this card is that Gigabyte offers an all-around better solution at a similar – if not lower – price. And now, we have a card from Zotac. 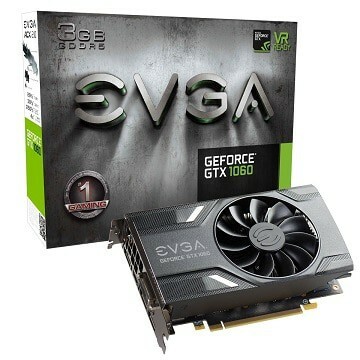 While this Hong Kong-based company is not exactly the oldest Nvidia partner, having only been founded in 2006, they have certainly established themselves as one of the most reliable manufacturers of Nvidia graphics cards. 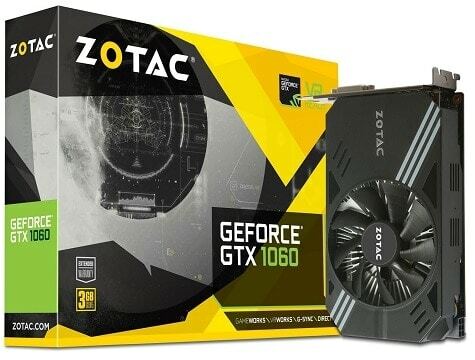 The Zotac GTX 1060 Mini is definitely a quality product, and it combines several key elements that make it the very best small form factor GTX 1060 available right now: it packs design, build quality, and performance into one decently-priced package. There’s no doubt about it, if you’re putting together a Mini ITX build, you can do no better than this card. While it doesn’t offer performance superior than the EVGA model that we’ve mentioned first, we much prefer the design and the build quality that went into this one. On top of that, Zotac’s 6GB model goes for a little cheaper than EVGA’s does, so there’s that, too. As for the downsides, there’s the same issue that we’ve already talked about in the first entry: single-fan cooling leaves little wiggle room for overclocking and the card won’t be as cool or as quiet as dual and triple-fan models are. Next up, we have Gigabyte, a seasoned Taiwanese hardware manufacturer that is usually right up there with Asus when it comes to PC components. 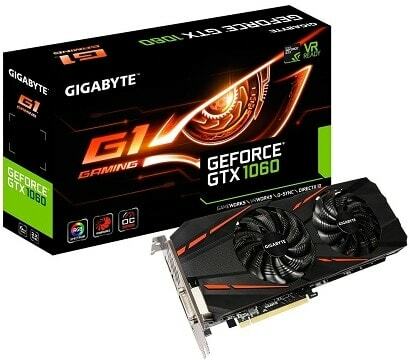 As for the card, we’ll be taking a look at here, it is the Gigabyte GTX 1060, equipped with dual Windforce fans and featuring a characteristic Gigabyte design. The Gigabyte GTX 1060 definitely one-ups the Asus Dual Series GTX 1060 in the aesthetics department, as it features a more premium design, complete with a backplate. On top of that, the black exterior is bound to fit in better with most setups. The Asus model does fare a bit better when it comes to performance, but it is a minor difference at best. 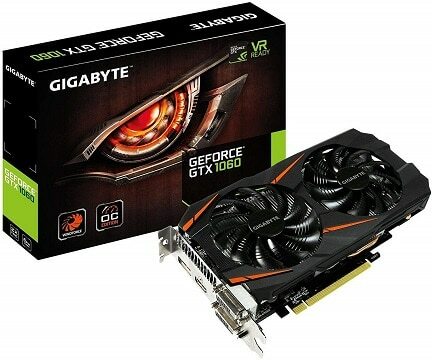 As for the flaws, the only thing we found odd about this card is Gigabyte’s choice of ports i.e. including two Dual Link DVI-D ports. While DVI can handle QHD gaming, we would have preferred having more DisplayPort and/or HDMI outputs instead, since they are more popular and more future-proof. Following suit, we have a graphics card from MSI, yet another highly popular hardware manufacturer whose expertise extends over many more components than just graphics cards. 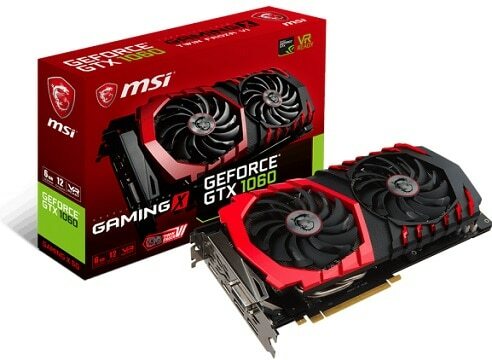 The MSI graphics card in question here is the MSI Gaming X GTX 1060, and as can be deduced from the name, it is definitely a performance-oriented model. As is always the case with MSI’s Gaming and Gaming X series, the card features prominent red highlights and the signature dragon logo in the center of both fans. Of course, this is not just for show, and this MSI GTX 1060 model performs admirably, offering great out-of-the-box performance and good overclocking potential. 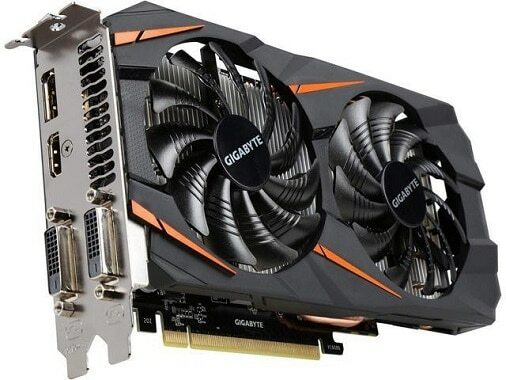 As for the downsides, the card is a bit pricier than the above Gigabyte model, but many people will also agree that the design of graphics cards in this product line is a bit over-the-top, so the conspicuous attention-grabbing exterior won’t suit everyone’s tastes. Of course, this is highly subjective. All in all, the card is rather well-built, complete with a backplate, and it offers great performance but will have a hard time fitting in aesthetically with most builds. And for the final entry, we have yet another Gigabyte model, albeit a much more serious one. This particular card belongs to Gigabyte’s gaming-oriented Aorus brand: the Aorus GTX 1060. This is one of the very best GTX 1060 models out there – triple-fan cooling, superb overclocking capabilities, and an overall highly appealing design that gives off an indisputable air of quality. One look at Gigabyte’s triple Windforce fans, and you’ll know you’re dealing with a product that’s bound to smoke some benchmarks. This card has the highest factory OC settings out of any card on this list and very few air-cooled GTX 1060 cards will be able to match the overclocking performance of this Aorus model. As for the aesthetics, the card not only features a sleek exterior complete with a metal backplate, but it also throws in some RGB lighting, which gives it some extra flair. Now, the main drawbacks to this card are its size and its price. While it may not be significantly more expensive than some of the previous models, the size is definitely something to keep in mind. After all, it’s three 80mm fans we’re talking about here. Because of this, it will be a no-go for smaller cases. As is usually the case with picking out PC components, there are many to choose from and while the differences between individual graphics card models might be considered minute at best by some, it is still worth considering which one would meet your needs best. As such, we’ll go over all of the important factors to keep in mind before making your ultimate choice. 3 GB vs 6 GB – How Much VRAM Do You Need? The GTX 1060 is a bit of an oddball in that it comes in two variants: one with 3GB and one with 6GB of VRAM. When it comes to deciding how much VRAM you need, you should consider which graphics settings are the most demanding in this department. First and most importantly, there’s the resolution. Rendering games in real time and in a higher resolution require more VRAM, and when it comes to 1440p, 3GB generally won’t cut it. 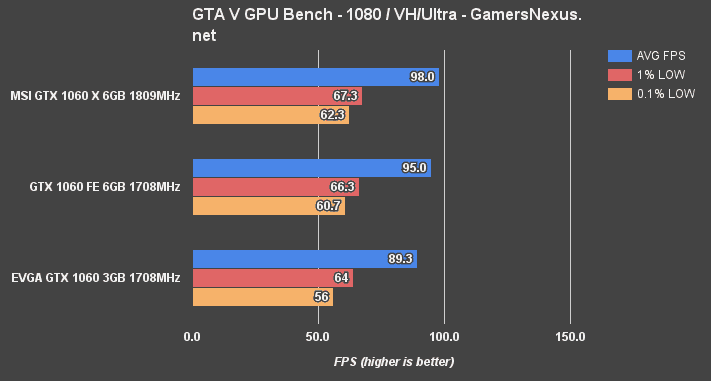 Of course, a 3GB GTX 1060 still has the same GPU performance, but if you’re aiming for 1440p or VR, you will inevitably need to lower some other VRAM-hungry settings such as the texture resolution, LOD distance, or some types of anti-aliasing. It goes without saying that some less-demanding games such as CS: GO or Overwatch won’t be too memory-hungry even in 1440p, but most newer AAA games will be. If neither of the above applies, then it might be in your best interest to save up a few dozen bucks more and get a 6 GB model. After all, games are getting more demanding year by year, and what is enough today may just not cut it tomorrow. The Cooling – Single-fan, Dual-fan, or Triple-fan? As you can see, the cards listed here all use open-air cooling and utilize either one, two, or three fans. So, which type is right for you? Single-fan cards have two key advantages going for them: they’re cheaper and they tend to be smaller, and both of these apply for the cards listed in our buying guide. With that in mind, a single-fan card would be a good choice if you’re on a budget or if you have a small form factor computer case. Keep in mind, though, because it’s one fan doing all the work, these cards tend to be a bit loud, not to mention that they just won’t support any serious overclocking. As for dual-fan and triple-fan cards, they tend to fare much better in terms of performance. The more powerful cooling greatly aids heat dissipation, thus allowing the card to be overclocked and offer better in-game performance. Plus, the card will be running more quietly when it’s not under heavy load. It goes without saying that a triple-fan card will almost always outperform a dual-fan one, but their primary drawback is their sheer size. Because of this, they can hardly fit inside smaller cases. 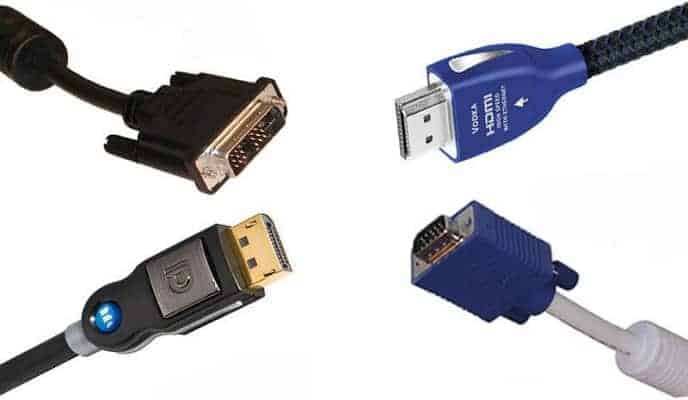 Connectivity – HDMI, DisplayPort, or DVI? You’re probably familiar with the three main ports used by graphics cards and displays these days: HDMI, DisplayPort, and DVI. Sometimes, cheaper cards and displays use VGA ports as well, although this analog connector is almost entirely obsolete. Now, when it comes to choosing between the other three, you should keep in mind that there is no distinct difference in visual quality between them. 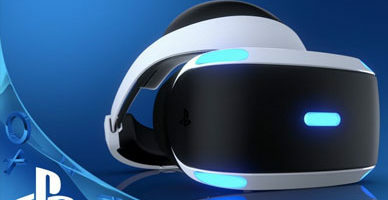 Rather, what is affected is the maximum resolution that they support, as well as the maximum refresh rate that they can manage in a given resolution. The version of HDMI included in GTX 1060 cards is HDMI 2.0, one of the newer versions of HDMI that supports a refresh rate of 60 Hz in 4K, all the while supporting a refresh rate of 120 Hz in 1080p. DisplayPort 1.4 fares a bit better, supporting 4K with 120 Hz and 1080p with 240 Hz refresh rates. As such, the latter would be a better choice if you have a 144 Hz 1440p monitor. As for DVI, it lags behind a bit, as it can only support 60 Hz in 1440p, which is its maximum supported resolution. It can still handle 144 Hz in 1080p, so there’s that, at least. In addition to that, it can only transfer sound when combined with an adapter, which is not the case with either DP or HDMI. With all of the above in mind, which card would we pick? Well, we’d have to go with the Gigabyte GeForce GTX 1060. It is our graphics card of choice since it is a very well-rounded solution, bringing together a sleek design and good performance in a single decently-priced package. 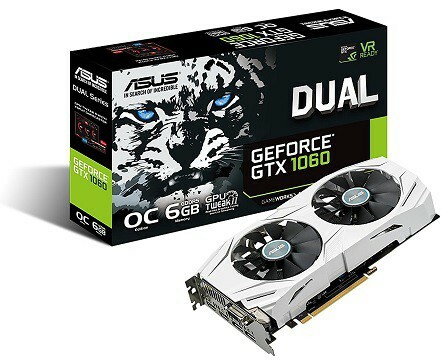 If you’re on a tight budget, we’d suggest the Asus Dual Series GTX 1060 instead, as the 3GB version of that card is the cheapest GTX 1060 that you can get at the moment. Not to mention that the performance holds up quite well compared to the pricier models. But of course, those are only our picks. If you’re building a more compact gaming PC, the two EVGA and Zotac models are the obvious choices, while the Gigabyte Aorus GTX 1060 will be the most appealing for those seeking to squeeze as much performance as possible out of this mid-range Pascal GPU. Tell us if you agree with our picks in the comments below, and as always, let us know if you think we overlooked something important or made any mistakes and we’ll do our best to correct them as soon as possible.